So.. my kids and I recently were lucky enough to go and see the new Paddington Bear Movie. Oh and how much we enjoyed it. I was particularly impressed to hear The Englishman chuckling away. I could go on and on about what we thought about the Paddington Movie, but I will send you over to my Film Blog to read all about it! 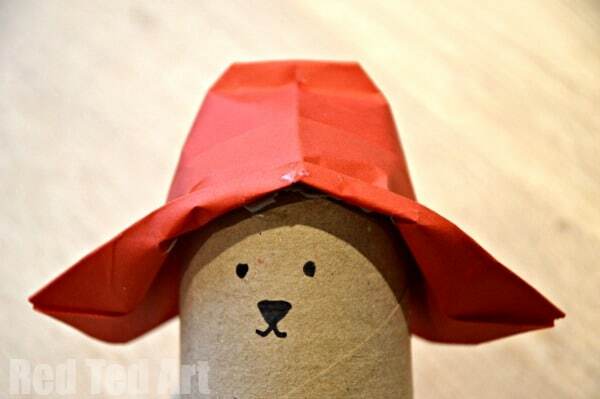 In the meantime, I rather fancied doing some little Paddington Bear Crafts. 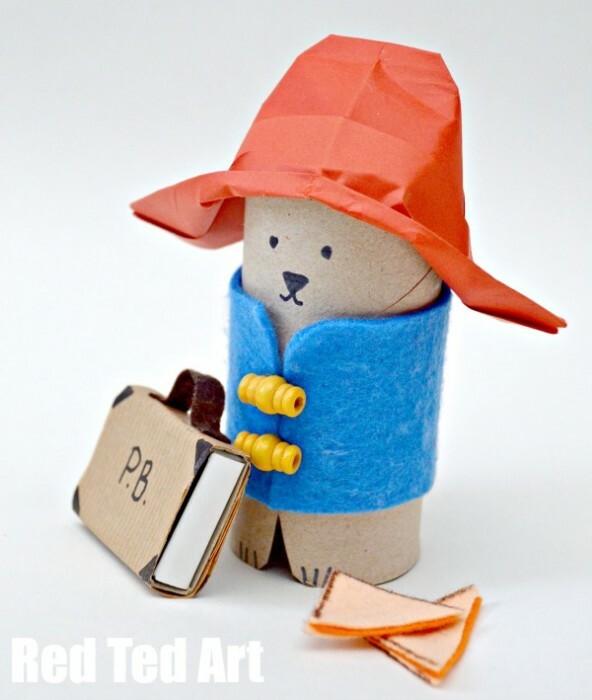 As a huge fan of TP Rolls, I thought a TP Roll Paddington Bear would be our best bet (though I have some more ideas up my sleeve **come back for more**). UPDATE: This Paddinton Craft Idea goes really well with out Origami Padding Bear that we have made since (really easy too, I promise!!) and the two together would make the perfect Paddington Party Ideas – treat bags + party invites! 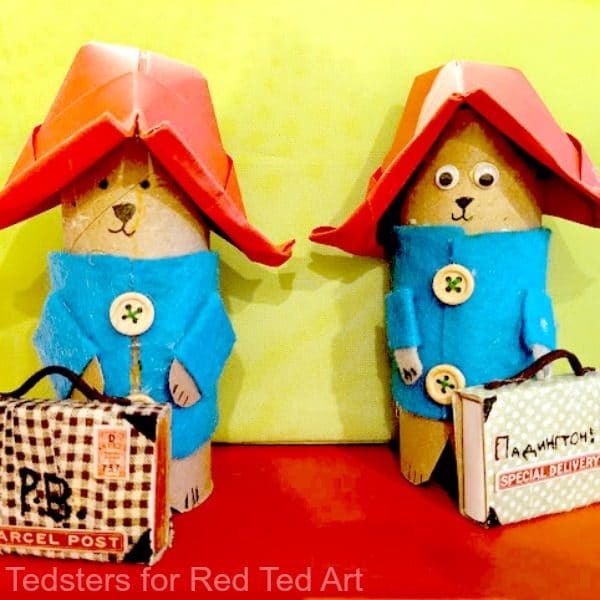 Our TP Roll Paddington Bear was first published in December 2014 and has been updated and republished for you convenience! 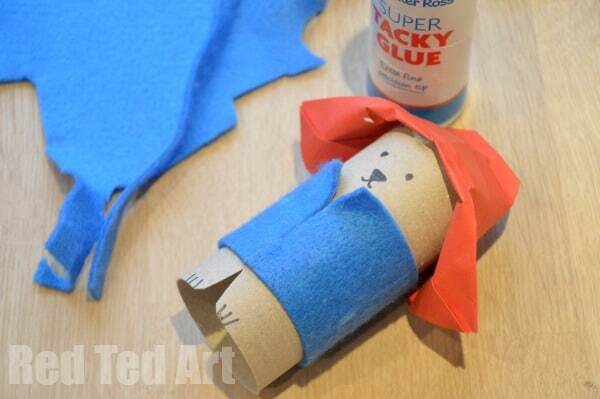 Our TP Roll Paddington Bear was quick and easy to make using a TP Roll, Paper and felt, as well some wooden beads I found. I appreciate that not everyone has felt and beads that happen to be JUST perfect… you could easily PAINT on a blue coat or use blue paper too. 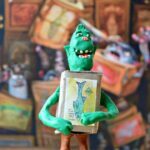 But why not have a rummage around your craft stash and see what you have?! But before you move on.. make some tasty Paddington Cupcakes… then sit down for a yummy crafternoon with your kids!!! Watch the how to video or follow the step by step instructions below! 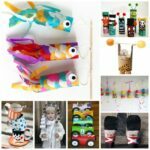 1) Begin by making a simple paper hat (follow these paper boat instructions – just do “half” and you will have your hat). 2) Then fold the tip of the hat back wards (to give it that square top) and the sides of the hat up, to give it that brim. It is a bit of a “fudge” and to be honest, I pretty much squished it all into shape. But think the end result is pretty effective, no? 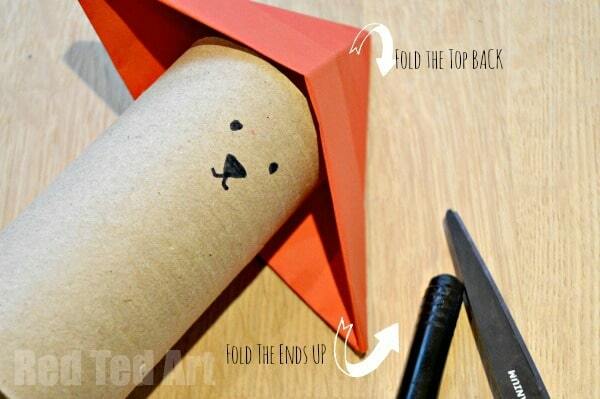 3) Glue onto your TP Roll and draw a face. 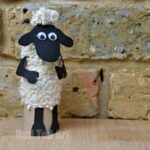 4) Cut some felt – I measured the felt according to my TP Roll – making sure their was space for the feet to peep out. 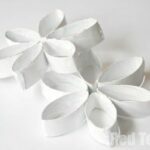 5) Glue on – but leave the top bits “unstuck” – a bit like a collar. 6) Snip some little feet and add paw claw lines as details. 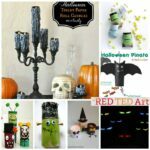 7) If you can find some beads that look “toggle” like, glue these on with LOTS of white glue or a hot glue gun. If you don’t have any, some black felt strips should look v nice too. 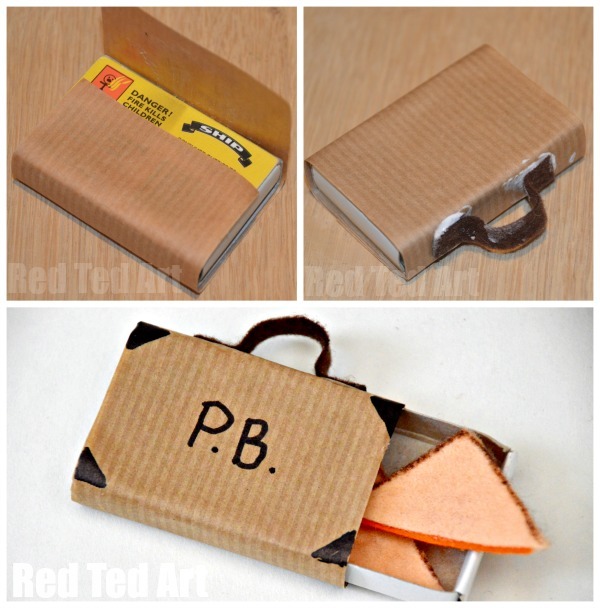 8) Let dry… in the meantime, we made a quick little Matchbox Paddington Bear Suitcase. Literally, I just wrapped a matchbox in brown paper. (We added two layers, so that the writing doesn’t shine through). Glued on a felt handle and with a black pen added the initials and details. Done. Ready for some Marmalade Sandwiches to go in. 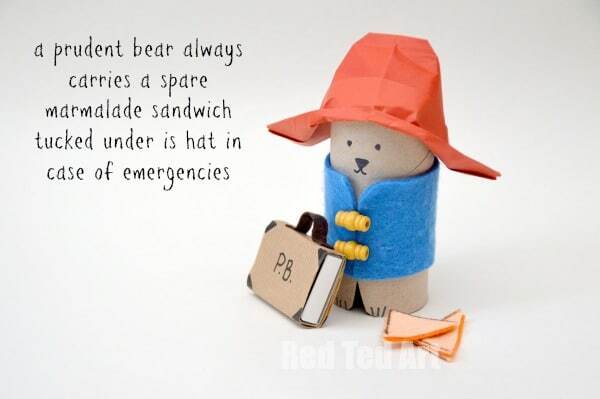 **Cough** then I got carried away and decided to make some Marmalade Sandwiches too for Paddington Bear- in case of emergencies of course- just cut out some felt pieces and glue together and then with a brown pen, add some crust! So.. 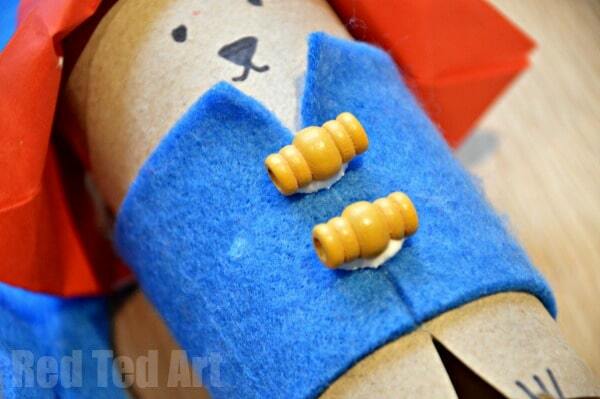 I hope you enjoyed our little Paddington Bear Craft and that you will have a go too! Afterall, “It is nice having a bear about the house”. I love how my lovely reader Claudia, turned these Paddington Bears into little Party Bag Treat boxes!!! Don’t they all look fabulous together!? And another fabulous photo sent to me via a YouTube reader! Aaaaaah. Shame your boys are “too old” already! I’d love the Paddington Bear books as a child and I can’t wait to take my three youngest children to see this movie. They’ll love it! Unfortunately, it doesn’t release here in the States until January. In the meantime, I’ll introduce them to the books and share this craft with them. Love it. January?! Really!! I didn’t realise that! Ack! 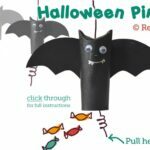 My oldest daughter is lucky enough to enjoy the new movie tomorrow with her school class- so I will quickly craft her your cute little P.B. as a surprise in the morning saying “Enjoy the movie!”. Thanks for sharing! This is ADORABLE. We are having a special Paddington Picnic Storytime next week in celebration of his movie debut in the US! This is a perfect craft for us — thank you so much for posting! Thanks so much! We had such fun making our Paddington Bears over the weekend. Came up with Smartie boxes for the suitcase as I didn’t have a small enough matchbox. Or your video is so cute! 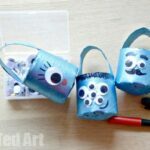 Making these today with primary three. Heaven! 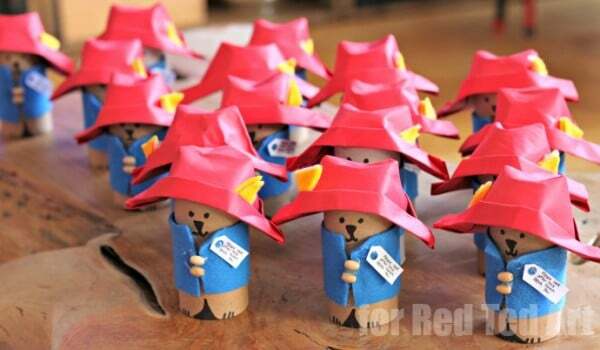 Will try and show you a photo of all 44 little Paddingtons! We absolutely love this, thank you! How to add a photo for you to look? Do email me on info@redtedart.com 😉 thank you! 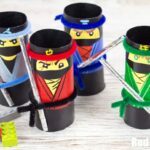 Oh my that is the cutest toilet roll holder craft I ever did see!